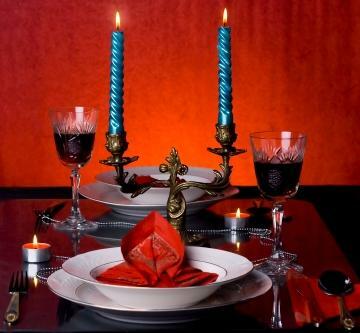 Romantic candlelit dinner table is ideal for love. A romantic candlelit dinner is the perfect date, whether you're trying to make a good first impression or celebrating your tenth wedding anniversary. Setting a romantic scene with candles and other items is a sweet gesture that tells your partner just how much you care. A candlelit dinner can be as simple or elaborate as you'd like it to be. From a simple picnic with candles and flowers for extra ambience, to a full course meal with fancy silverware and an extravagant dessert, it's easy to choose something that will make your date feel special and cared for. While it may seem easy to choose candles for a romantic candlelit dinner, there are a few things you should keep in mind. Go easy on scents - Scented candles are lovely, but too many of them, or scents that are overpowering, can interfere with the food being served. Size and color - These really don't matter, unless you're going for a theme or color scheme. Many small candles can have a huge impact, while one singe candle can be very romantic. Candle holders - Make sure that you have suitable candle holders to provide a safe base for your candles. Candle type - Taper candles are the classic dinner table staples, but don't feel restricted by these. Try a big container candle, a candle centerpiece, or even a collection of different types of candles all on a pretty tray. Personalized candles - If you really want to go the extra mile, consider making or purchasing a personalized candle for the occasion. There are many different locations where you can successfully host a candlelit dinner. Here are some suggestions that include common areas, as well as some unusual ones. At home - The kitchen or dining room table are obvious locations, but you could also set up a romantic dinner on the living room floor, or even in the bedroom. In the backyard - If you have a backyard and the weather cooperates, this can be a cozy spot for a romantic dinner. In the location where you first met - This idea is limited of course, but if you first met in a place where a picnic or sit-down dinner can be held, it's a romantic choice. At a public park - Many parks have picnic tables or other seating arrangements, and an evening of subtle romance in a public place shows the world how much you care. Of course, you could always choose to have a candlelit dinner at a restaurant, where all of these details will be taken care of for you! If you go this route, pick a restaurant that won't be too crowded, has the right atmosphere for a romantic meal, and try to get a table that's somewhat private. A romantic dinner with the warm glow of candlelight shouldn't be complicated. It should be all about spending quiet time with your partner and enjoying each others' company. Here are some easy ways to make it a special dinner to remember. Bring along a small bouquet of fresh flowers or a single rose, and let your date keep them after dinner. Men like to get flowers too! If you're not an especially adept cook, take-out food from your favorite restaurant works just as well as homemade. Consider bringing along some music to set the mood. Your romantic candlelit dinner doesn't have to celebrate any special occasion. Surprise your partner on any random night. Once you've begun your candlelit dinner, relax and enjoy the evening. You've done something special for your partner, and he or she will appreciate your efforts. Have a wonderful time!